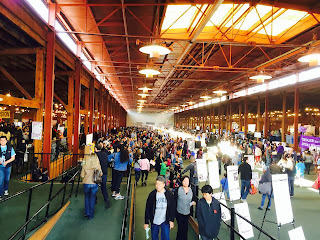 SF School Fair - What did you think? We attended yesterday's SF School Fair and were pleasantly surprised with the information we were able to receive. The School Fair is basically a swarm of lost parents asking a lot of questions of each school's principal, PTA members and aftercare staff. I really had no idea what to expect, but was pretty happy with how painless it felt. After the first couple of discussions, we found that we could learn a lot about how the schools present themselves, how well the parents responded to our questions, and what the schools focus upon in their materials. While I still don't feel like it replaces walking into the building, I found the conversations enlightening. I'm still trying to decide it I am going to add any schools to our tour list, but there are definitely a few that will come onto our lottery list following conversations. So, what did everyone else think? Was it useful? Did you discover any new schools? Did any drop off your list after talking with the school reps? Inquiring minds want to know!